This is it Nova fans. The big moment we’ve been waiting is finally meet. Two generations of Novas come face to face. On one hand we have the veteran Nova Richard Rider. He’s back in action, but the world has changed a lot since he left. This means he will need some help readjusting, luck for him there is some fresh blood in the nova corps, his name is Sam Alexander. Prepare for the beginning of what looks to be quite possibly the best space bromance ever. Sam has heard plenty of stories about the legendary Rich Rider so in theory a team up with him would be a dream come true. However Sam may be a rookie but he’s not stupid. He’s been burned by this kinda stuff before, so he calls in his team for an assist. They confirm that the old guy in the helmet is indeed the real deal Rich Rider. It leaves many of the young heroes star struck. Leading to a lot of great banter between Rich and some of the Champions. Getting all this new information is understandably a lot for Rich to take in. Sam knows that feeling all too well so he decides to help Rich chill a bit by taking him home and introducing him to his family. Rich is comforted by this sense of normalcy and the two Novas bond over their mutual responsibility and pressure of being a cosmic hero, but we all know that normal can only last so long so the novas decide to have fun the best way novas know how, it’s off to space. Of course the first place Rich wants to go is his old stomping ground Knowhere to see his old friend Cosmo the Space Dog. The two of them joke and laugh just as you would expect old friends to do. They even throw some jabs at Sam’s expense and the poor kid doesn’t appreciate being ganged up on even if it’s all in good fun. Too bad all good things eventually have to come to an end, in the end the novas end up getting cornered and we have ourselves a Mos Eisley cantina situation. Let’s see who ends up shooting first. Perez once again does a great job on the art. It truly does have the feeling of a fun carefree space romp, and as a Nova fan that’s exactly what I want from this series. Each panel is bursting with energy and as I read it I couldn’t keep a big goofy smile from spreading across my face. The issue was action pact and dynamic while also having some great comedic moments and gags in their for some added moments of levity. 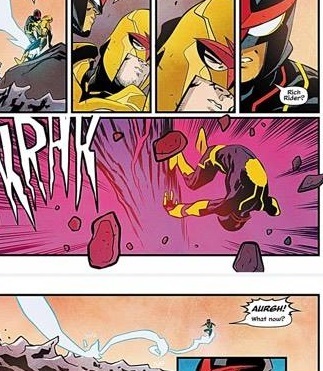 This helps ground the book without sacrificing the fantastic cosmic elements that Nova has come to be known for. Much like the story the art for this issue is very balanced. 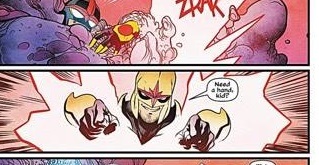 I’m a huge marvel cosmic fan so I was always gonna be a soft sell on Nova to begin with especially with the Nova I grew up with Richard Rider returning. My biggest fear going into this series was that they would not be able to evenly balance panel time for the two Novas. Thankfully my fears were not realized. Rich and Sam are a great space bro duo. Rich is experienced he knows quite a few tricks to get out of sticky situations. The main problem with Rich is that he is understandably out of touch. This is where Sam comes in. He may be green but he’s grown up in the new marvel universe so he can help Rich readjust. It creates a perfect balance. These two need each other, and with their great chemistry these two space bros are bound to go places. 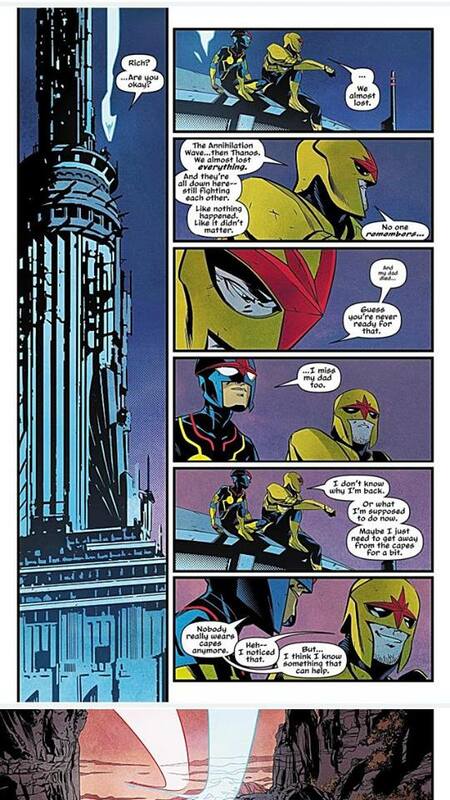 Do yourselves a favor if you love the cosmic side of the marvel universe I highly recommend that you go pick up Nova #2. It’s a fun, light heated, character drive space adventure that will have you hooked.